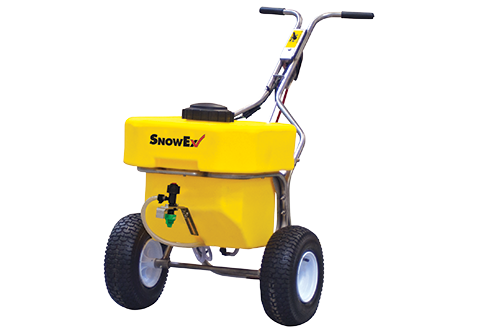 When harsh winters hit in Token, help create safer walking areas with a walk behind liquid sprayer from SnowEx. These walk behind liquid sprayers make quick work of some of the toughest winter applications such as stairs, sidewalks and walkways. The battery operated, electric sprayer offers operators the flexibility to apply brine through either the nozzle on the front of the tank which can spray up to 48” wide or through a professional duty spot spraying wand for those tough to reach places. 12-volt electric pump is powered by a rechargeable battery. Units are equipped with professional-duty, adjustable spray wands for spot-spraying applications. Boomless nozzle can be height adjusted and spray ice melters up to 48 inches wide. An easily accessible, extra-wide vented cap allows for quick filling. Spraying Width Up to 48" Up to 48"